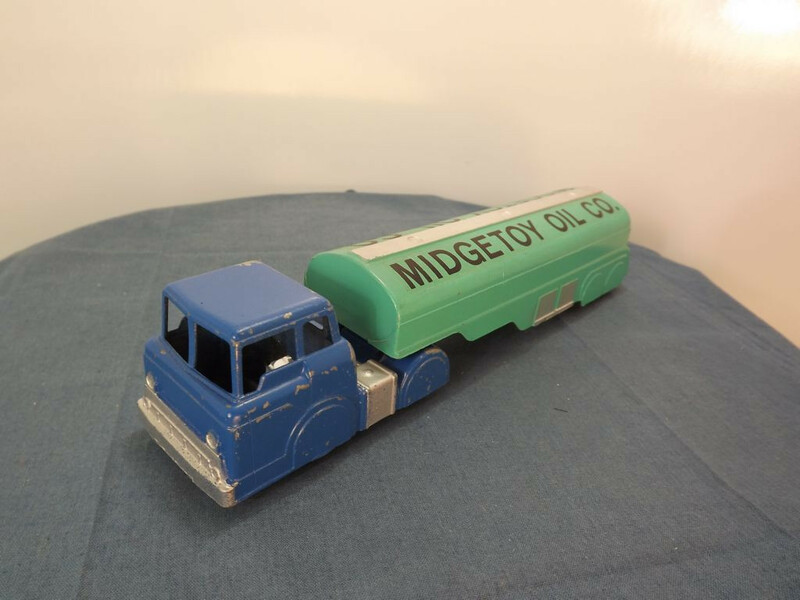 This is the Midgetoy 1950s Ford Articulated Oil Tanker in the Midgetoy Oil Co livery of Blue and Green. 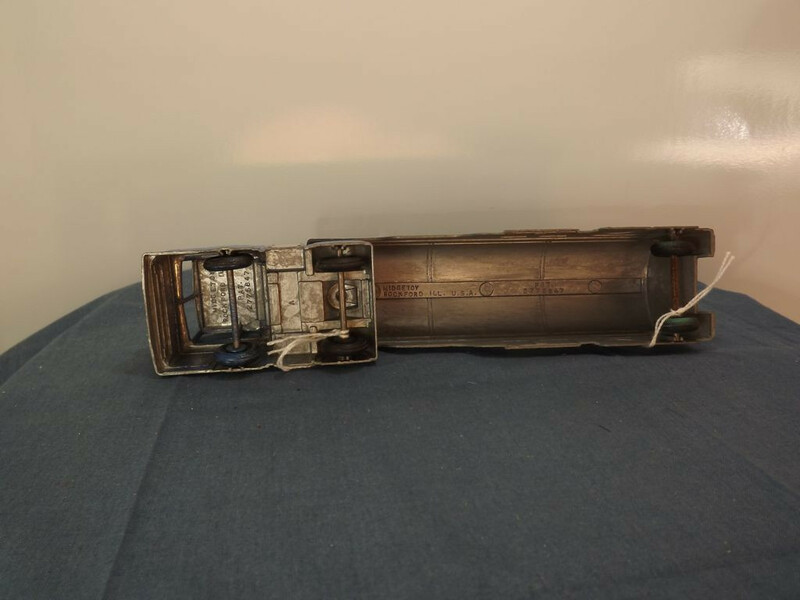 The model is 204mm long, 42mm wide and 44mm high. The model has no opening parts or glazing. The tractor unit is a simplistic casting of a 1950s Ford with the headlights and grille picked out in silver (mask sprayed) and the fuel tanks and diamond plate behind the cab also picked out in silver. The tanker trailer is also a simple casting with cast body lines, filler caps and rear hose points. It is interesting to note the trailer cast been cast to indicate two sets of rear wheels but only one rear axle and wheels has been fitted. The unit has has side locker doors mask sprayed in silver, as are the rear hose points and the top centre of the tank and filler caps. 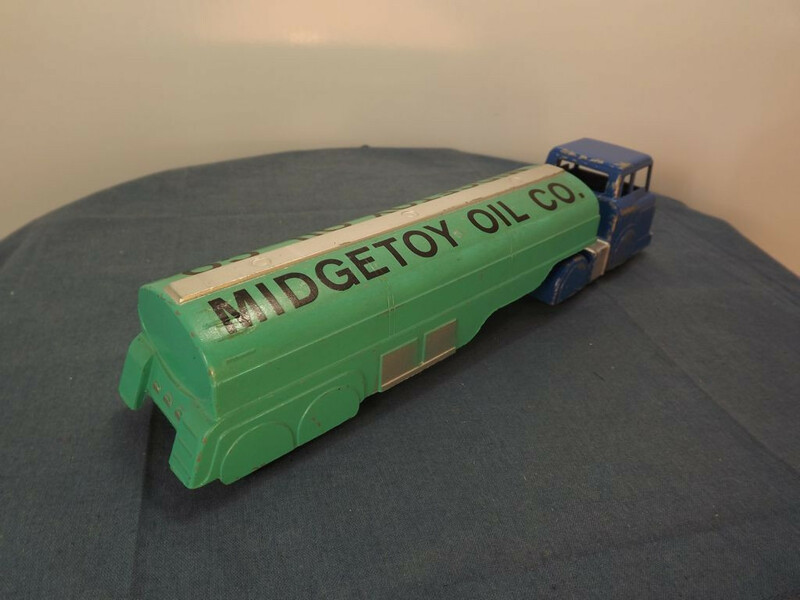 Each side of the tank carries the words "Midgetoy Oil Co." in black lettering on a clear waterslide decal. All wheels on the model are solid rubber fitted to a steel axle that is pinch-crimped in place to the body of the tanker and tractor unit. There is no baseplate to either the tractor or trailer. The underside of the tractor unit has the words " Midgetoy, Rockford ILL., U.S.A, PAT., 2775847" cast on 5 lines under the roof of the cab and the mold identifier "A" cast under the diamond plate section. The trailer has the words "Midgetoy, Rockford ILL. U.S.A." cast on the underside of the filler cap area on two lines, toward the front of the tanker, and "PAT. 2775847" on two lines towards the rear of the tanker.